Fans of this popular franchise sparked by the hit 1999 movie starring Brendan Fraser, Rachel Weisz and Arnold Vosloo will no doubt be jumping for joy at the presence of this slot on the online slots market. The rest of us should have seen it coming. A movie franchise with an Ancient Egyptian theme… it’s made for the slots world! 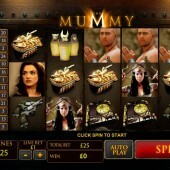 The Mummy is a 5-reel, 25-payline from slot developer Playtech. Playtech has a proven track record with releasing slots based on hit movies. The awesome Captain America slot and the equally as superb The Avengers slot are just two examples of previous works that the developer has delivered with distinction. This slot immediately stays true to the movie with all the main actors and characters from the movie making an appearance on the reels. You have Rick (Brendan Fraser), Evelyn (Rachel Weisz), High Priest Imhotep (Arnold Vosloo), and Imhotep’s lover (Patricia Velasquez) plus other generic Egyptian symbols such as scarabs and ancient books fill the reels. The main bonus feature on this slot immediately jumps out as the Lost City Adventure Bonus. This is a randomly-triggered bonus feature that comes with six special features within itself. When the Lost City Adventure Bonus is activated, you will be taken to a secret chamber in the Lost City where you will need to pick from a choice of crates to win cash until the Collect symbol is revealed. You will then be rewarded a multiplier up to 4x and one of the special features will also be picked. There are six special features that can be activated. These include the Scorpion Scatter where the Scorpion symbol becomes an extra Scatter, the Expanding Mummy where the Wild symbol becomes an Expanding Wild, the Scarab Attack where if you hit a Wild on Reel 3 two more Wilds will appear on Reels 2 and 4, and Collapsing Reels, where symbols that form winning combinations explode and disappear to be replaced by symbols from above. In addition, the Mummy Power feature includes Wilds that will trigger a 3x multiplier on wins and the Mummy Re-spin where a reel that hits a Wild will then freeze until you hit a winning combination. There are also two other bonus features included in this slot. The first is the free spins bonus round where you can win 5 free spins plus one super spin. In order to trigger this feature you must hit the Free Games symbols on Reels 1, 3 and 5 at the same time. In addition to the free spins, during the free spins you can collect Wilds. Every time you hit a Wild on the reels during the free spins it will be added to the Collected Wilds. Once the free spins have finished, the Wilds you have collected will then be spread across the reels and your super spin will commence giving you a great chance to hit a number of winning combinations. The final bonus feature is the Mummy Hunt Bonus. This is triggered when you hit the Mummy Hunt Bonus symbols on Reels 1 and 5 at the same time. In this round, you are taken to the depths of a secret chamber where you must hunt mummies to win prizes. Each mummy killed will reward a cash prize with up to a 3x multiplier. The Mummy is a slot that really should have been released sooner than it was. Playtech have released some superb slots to date based on Hollywood blockbusters and this is up there with the best of them. 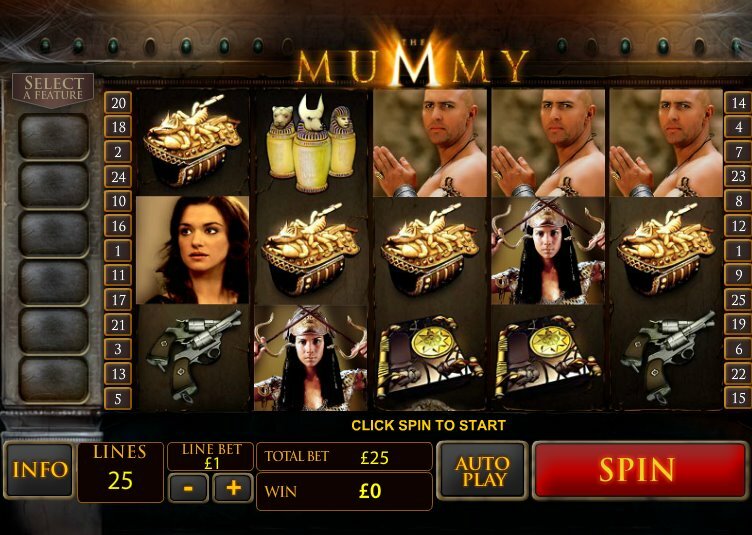 As well as attracting fans of the movie franchise, fans of other Egyptian-themed slots such as IGT’s Cleopatra slot and Egyptian Riches from WMS Gaming will definitely want to give this a try. Some might argue that there’s a bit too much going on in this slot to keep up but if you love your slots busy then this will be perfect for you.